As the above examples, illustrate the counterintuitive features of MCIs can involve either breaches of expectations (being able to fly) or transfers of non-intuitive expectations (a statue moving around and talking). However, the important point is not simply that something bizarre or weird occurs in a MCI concept but specifically that expectations which have been experimentally validated as intuitive are being violated. This is an important distinction as there is a significant body of research involving very young infants from around the world which has revealed that humans are born far from being blank slates and instead come with a host of early developing intuitive expectations or ‘core knowledge’. And the argument is that violating these universal, hard wired expectations are what make MCI concepts so attention grabbing for our cognitive systems. More attention grabbing, also means that MCI concepts should be easier for us to remember and more motivating for us to pass on/talk to others about than other kinds of concepts. In particular, intuitive concepts are too mundane (a dead person) and extremely or maximally counterintuitive (MXCI) concepts are too difficult to recall or transmit accurately (a dead person who walks around, reads minds on a Thursday afternoon and can disappear when it rains). Returning to zombies then it would seem that the motif of a person violating biological expectations and returning from the dead is both attention grabbing and simple enough that the concept is easy to understand and interesting to imagine. 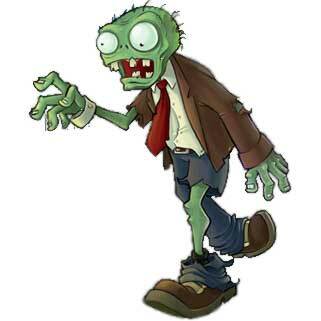 Jesus is sometimes referred to disparagingly as a Jewish Zombie but regardless of the mocking intent it indeed be that part of the appeal of the Christian bible story is due to the fact that Jesus at times fits into a MCI template. Indeed, historically the events were he appears to demonstrate MCI properties were often those used when trying to spread Christianity (walking on water, returning from the dead, ascending into heaven). Yet Jesus, or the wider Christian God concept, highlights a significant problem for MCI focused theories of religion because, as a memorable song by Tim Minchin highlights, when considered collectively Jesus is far from an MCI concept as he could walk on water, levitate, return from the dead, read minds, heal wounds, be both human and divine, control the wind and so on. Researchers have responded to this by suggesting that extra cultural scaffolding can enable more complex counterintuitive concepts to survive and by noting that despite the ‘theologically correct’ presentation of certain gods seeming to fit a MXCI template when described in stories or by people the gods seem to morph into ‘theologically incorrect’ MCI versions often using only a single conterintuitive feature per story. If all this sounds too theoretical then it might be interesting to know that there is a growing body of empirical and experimental research which has sought to test the predictions whether MCI concepts are really more memorable than MXCI or intuitive concepts or concepts which are bizarre but do not validate expectations derived from our ‘core knowledge’. For example, Pascal Boyer & Charles Ramble (2001) conducted recall experiments cross culturally in Nepal, Gabon and France and found that in each culture MCI concepts were better recalled than bizarre concepts. Similarly, Justin Barrett & Melanie Nyhoff (2001) invented a series of stories with MCI, intuitive and bizarre concepts embedded within them and found that recall for MCI was not only greater at an individual level but also were transmitted more accurately when transmission chains were introduced (participants passing the stories on other new participants). Turning to actual material; Anders Lisdorf (2004) looked at Roman prodigy lists (records of important signs) recorded over 150 years and found that prodigies containing MCI concepts were most common (56%), followed by prodigies with bizarre concepts (41%) and finally just 4% with entirely normal concepts. Another group of researchers looking at a cross cultural selection of folk tales found that 79% contained one or two counterintuitive concepts and from amongst this 93% were MCI. 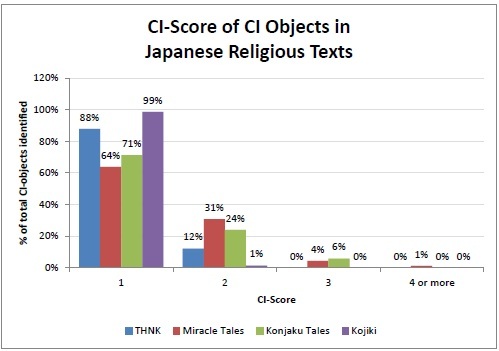 I’ve conducted my own research into MCI concepts looking specifically at religious material from a range of Japanese traditions and found (amongst other things, that there was an average of 1.1 counterintuitive concepts per story and the vast majority of these were MCI concepts, in that they only had one or two counterintuitive features (see the table below). Bizarre items also appeared to be much less common and there were in fact even a few instances of zombie like counterintuitive beings (although they, like Jesus, lacked the requisite craving for brains). On a side note I know this is being posted on Monday and not Sunday but as I attended an Irish wedding this weekend I think I have a valid excuse this time.